MamaBreak: Safeskin Kids Antibacterial Gel Review! My little guy is cautions, but he STILL gets bumps, bruises and scrapes. 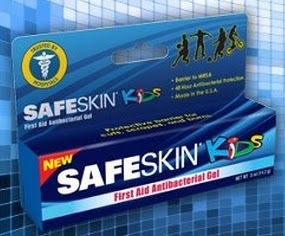 We just tried the SafeSkin Antibacterial Gel and he LOVES it--and SO do I ! He actually asks for it after all small spills in the house, its super cute. You can get it many stores, but this coupon link for $1 off will work at Walmart. It is sold at a suggested retail price of $4.95. I love this product because its something I haven't tried before and it lasts up to 48 hours against germs! I received a gift card and a tube of SafeSkin through a blog program. My opinions are my own and are written to share with my readers. Interesting product. Never heard of it before. Will have to check it out. Never heard of this. Once again thank you for sharing such great new products!